Google Play Protect comes to Play Store, adds a layer of security to your Android..
General News: Google Play Protect comes to Play Store, adds a layer of security to your Android..
General News Google Play Protect comes to Play Store, adds a layer of security to your Android..
Google’s Android platform has often been at the receiving end when it comes to security. There have been multiple questions raised on the device’s ability to protect users from fake apps or spam apps that can cause potential harm to the device and also compromise data. The search giant has announced a new security feature for Android devices through the Google Play apps store at Google I/O 2017. The new feature is called Google Play Protect. Google Play Protect is a service to test apps and check their safety. The app will automatically determine if any app on the device is affected and deal with it accordingly. Google Play Protect will be gradually rolled out to all devices supporting Google Play Store. Though the security feature runs automatically in the background, users can activate the features themselves and start a scan if they suspect any of their apps. The feature will scan all apps on the user device and automatically report and remove affected apps. The feature will also kick in each time a user tries to download any app. 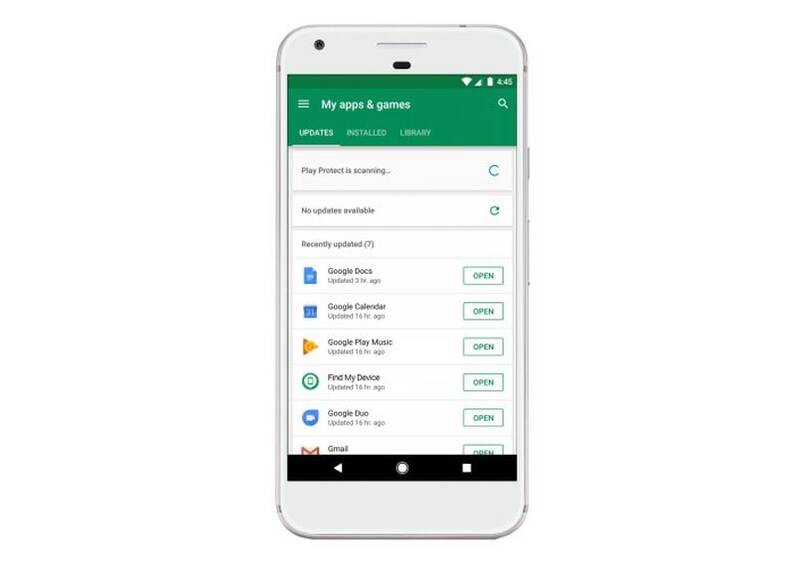 Google has ensured that Play Protect is not restricted to only apps downloaded from the Play Store but will scan even third-party apps from other market places downloaded on Google. Apart from scanning all apps, Google Play Protect will also kick in, in the event of the user losing the device. Find My Device feature will be auto-integrated in the new functionality. It will give users the ability to track a lost device, call it, access and erase all data remotely. It is compliant with Android smartphones, tablets and smartwatches. The feature will be automatically enabled as a part of Google Play Protect. The new service opens a new “Safe Browsing” feature on Google Chrome so users stay safe while using the internet. Many times, viruses or bugs attack smartphones and computers through internet searches. The new security feature will block websites that are sketchy or that seem unsafe for the reader. Google Play Store has millions of apps and the store scans billions of downloaded apps each day. Before an app is listed on the Play Store, the developers must make sure the app passes all the safety checks, rules and norms laid down by Google. However, at times, there are certain apps that bypass the checks and pose a threat to users. Also, in case of apps from third-party marketplaces, the security is not verified. Google Play Protect will bring security to over two billion active Android devices.